Imagine a sunny beach or a romantic café. The sun is high, the wind cool, the atmosphere is electric around you. Yet all eyes are on you! Puzzling, right? This may sound hard to imagine, but our men’s designer swim shorts provide you just that. They are stylish enough to have all eyes on them yet also comfortable enough to let you go about your day as you please. We do not compromise on quality or comfort, and hence giving our customers the best there is to give, is what we strive for. To give you what we promised, these shorts have been mesh lined with ultra-soft polyester, to give you comfort all day long, along with the aesthetics that would please not only you but anyone who lays eyes on these fashionable shorts. In several of his latest vlogs Jon Olsson Delér is seen wearing Decisive designer shorts. He seem to be a fan of both the Palm swim short and the Dots. Take a look for yourself. With the summertime being an ideal time to go to the beach, why not associate your attire to the ideal things that go with summer? When the words ‘summer’ and ‘beach’ come to mind, I’m sure the words pineapples and watermelons would surely pop up in that thought bubble (along with waves, surfing, and beach shorts). 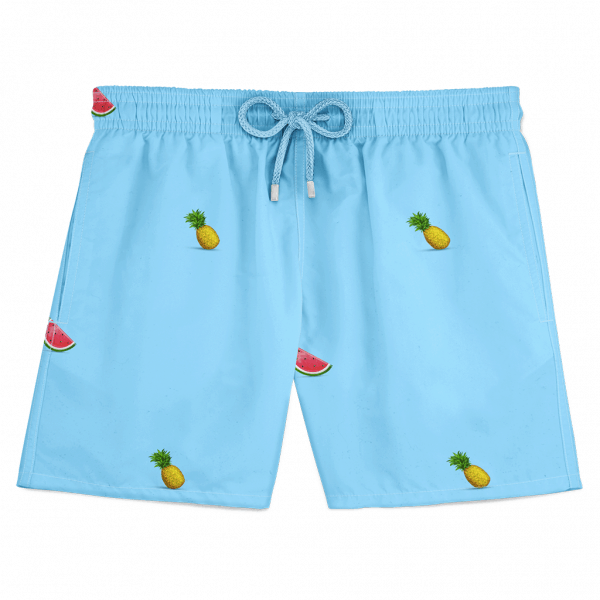 Hence, it doesn’t come as a surprise that the ultimate groovy garment for men’s designer swim shorts would have something to do with watermelon and pineapples. A mixture of extreme comfort, fashion, and an easy breeze look, these shorts are good to wear to the beach, cafes, or any other location. If you’re still not sold as to why purchase these shorts, we even have more to offer. Fashion, comfort, and what more? Practicality, yes! These men’s designer swim shorts with pineapple and watermelon on them have a set of 4 different pockets. Two side pockets just like any other shots, one back pocket with a Velcro flap, to ensure your valuables don’t fall out, and one secure pocket on the mesh line (use to store cards, etc.). Because we stop at nothing, to give our customers the best. Another in-demand men’s designer swim shortsare Flamingo swim shorts. Flamingos are tall, pretty and mesmerizing to look at. Not only are the bird species admired by the world, but are also popular as artefacts to be set up in lawns, as plastic flamingos. Why wouldn’t one want a picture of these mesmerizing birds on their swim shorts, so they’re up to the world to be seen and admired by everyone! The word flamingo originates from a word flamma, which translates to fire. 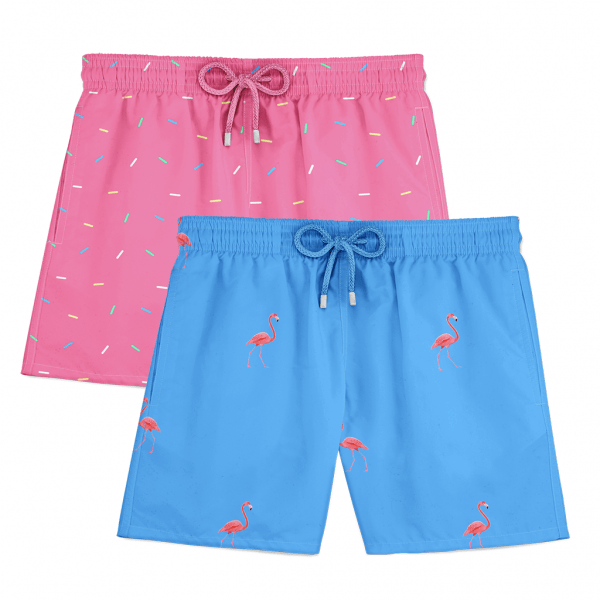 And you would indeed look fire wearing one of these amazing flamingo swim shorts. Simple, sleek, and cute, these flamingo swim shorts go well with most body physiques and with anyone. 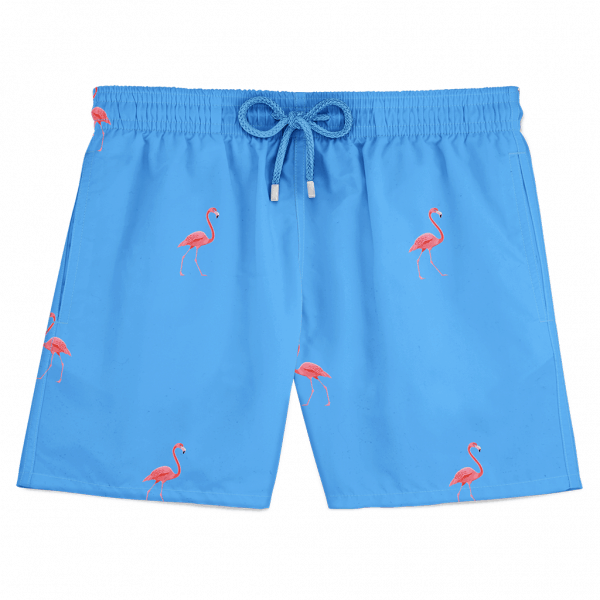 So begin wearing this cool swim shorts to pool parties or beaches, and casually stand out just as a flamingo does, mesmerizing and calming. If you’re aware of our products here, you would already know that we don’t compromise on comfort, making each garment in such a way that it grants you 100% comfort in all situations. Hence, these flamingo shorts bring you beauty and comfort both. Our short’s mesh lining has been made from ultra-soft polyester, to grant you extreme comfort in all mobility. So you can move around as much as you want all the while you’re comfortable wearing our product. A nice breeze, coconut palm trees, and the warm sun that is what the palm tree swim short symbolizes. These patterns on the men’s designer swim shortsnot only gives a cool and easy going breeze but shows a vibrant of playful patterns that in turn changes the whole aura of the wearer. Simple, but elegant, the little palm prints on these swim shorts give a whole environment of easy going and calmness, that is not only comforting to watch yourself wear it but comforting to see someone else wear such a cool aura swim shorts as well. Get in the groove with our palm swim shorts, and be in the mellow mood no matter where the location. These palm swim shorts are not limited to the beach, café, or sand, but to pool parties or any location which reminds one of the calm summer breeze. 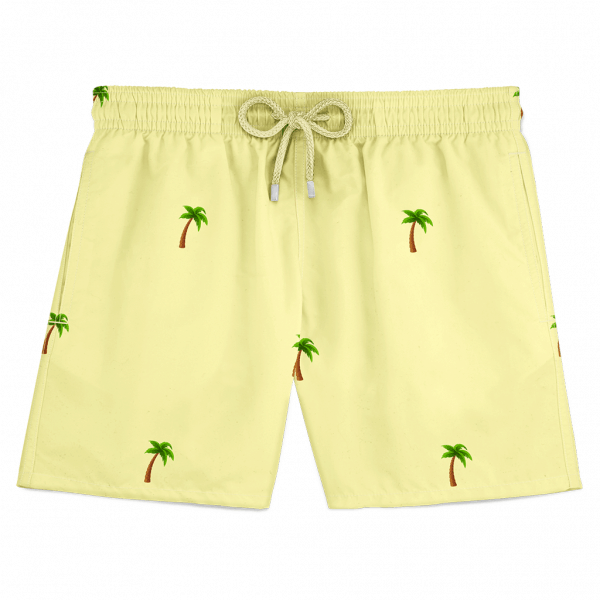 With these palm swim shorts, your personality is likely to shine, just like the cloth you’re wearing. The fun doesn’t stop there though; because these swim shorts not only give you an appetite for the eyes but give you the comfort of it as well. The shorts are made of mesh lining, from ultra-polyester. This means that you get the extreme comfort that you deserve, making your trip to the beach or any other location even more enjoyable. No compromise on the quality of the shorts is made as well, and we give you a three years guarantee to prove that to you. So you can set easy, knowing that you got the cool palm swim shorts, that are not only comfortable but is made of the highest quality of materials. The swim shorts also offers great functionality. It has 2 side pockets, which is a must for any shorts one would wear. 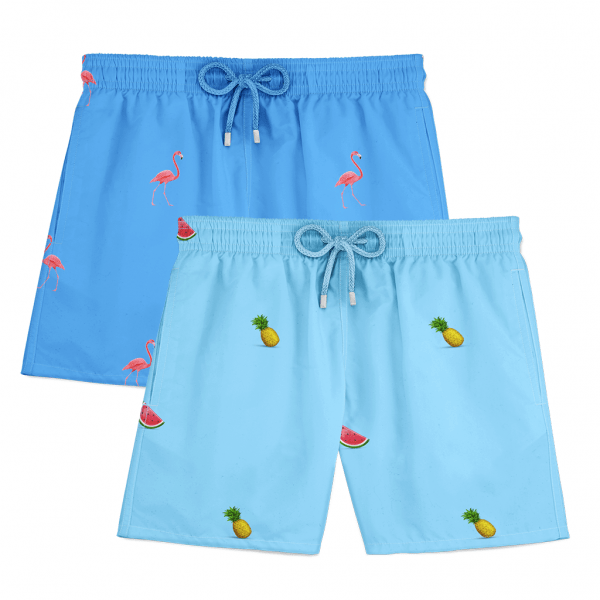 However, these palm swim shorts contain a back pocket with a Velcro strap, to ensure that your items are kept in a safekeeping environment, as well as a secure card pocket. So there is no such thing that you’re not receiving from purchasing our very reasonable palm swim shorts. The thought of a hot summer always associates thought of something chill and cool to simmer down and neutralize the heat. And what’s better than an ice cool Popsicle to do the trick! Not only is it extremely refreshing to cool down in the blazing heat, but the thought of a refreshing Popsicle elevates the mind as well. Our design of the Popsicle swim shorts is the perfect choice of men’s designer swimshorts as it describes the summer feeling precise. A nice dip in the cold water against the beating sun is the perfect way to enjoy the heat without catching that nasty cold. Now having a nice Popsicle is all good but sharing a double popsicle with someone is even better, we deliberately added in a double popsicle in the design to get a better feel of the summer trips with friends. Not only that but we added different types of popsicles to suit the theme as a whole. Our shorts are not only stylish but also extremely comfortable. The premium material gives a nice look and comfy feel, along with the polyester lining we use which never strains the skin, instead adjust according to the waist. This means that you have 100% comfort at all times no matter how much you jump around, or play around on the beach. Your comfort would not be compromised, no matter what you do! Also included are 4 pockets, 2 regular side pockets, a Velcro flap back pocket, and a secure credit card pocket so you can take your stuff on the go without needing to carry a bag. The material we use is indeed comfortable but also long-lasting, with the company giving a 3-year guarantee making them a perfect choice of swimwear, beachwear and outdoors. Unlike our other products, which are focused on pictures and the environment that surrounds them, these men’s designer swim shortsaren’t made for a specific location, event or season. The plain and sober look of these gives them a unique style appropriate for any time and season. Not only are these suitable for all season, but the age factor is also eliminated, where men of all ages are well suited to the style and pattern as it isn’t focused on any specific theme or concept. The simplicity in the design is what makes it so unique. The choice of colors that we implemented on it are such that they aren’t too poppy, but aren’t dull either. A completely different dual color scheme would make the 2 colors contrast such that they would become quite visible and would pop, making it look less sober and more colorful. We decided to use different shades of the same color so that the same sober look is maintained while giving it color and mood. With the mood being light as the shades of blue we chose to give a very cool and carefree feel to it. With the overall theme made clear for the dot swim shorts, no compromise on the comfort of the shorts have been made. Our men’s designer swim shortsare famous for its comfort in wearing them, and our dot swim shorts are no exception in the matter. Made from ultra-soft polyester, these swim shorts grant you 100% comfort no matter how long or wear you wear them. So you can keep looking fashionable as long as you want. The pros of dot swim shorts do not end here, however. Comfort, Fashion, and Usefulness, the dot swim shorts have a set of 4 pockets to keep them in use as well. Two side pockets, similar to any other shorts, one back pocket with a Velcro flap, to ensure your valuables don’t fall out, and one secure pocket on the mesh line for the storage of cards, etc. There is certainly no downside to buying these shorts! Why not choose a 2-pack or 4-pack? The more, the merrier is how the saying goes, and we at Decisive Beachwear firmly believe that! If you’ve been having a hard time deciding which of these stylish swim shorts to buy, then why not opt for our reasonable 2 or 4 packs! By buying in packs, you not only get to save up money but also get a variety of swim shorts. So, whether you’re off to the beach or club, you don’t have to stick to just 1 pair of shorts. A man is only as fashionable as he is comfortable! Thus, in addition to stylish designs, our key focus has always been the comforting of our clients. Our swim shorts are available in a diverse variety of colors, designs, and sizes to cater to all your needs. The shorts are mid-length, well stitched and comfortable to wear. Thus, one NEVER has to compromise comfort for style! Summers are all about splashing in the waters and soaking up the sun! Whether you’re hitting the beach, playing beach ball, or walking around under the summer sun, your shorts are bound to end up wet, due to water or sweat. We, at Decisive swimwear, understand the challenges of summer days thus our swim shorts are equipped with efficient, quick dry technology. This enables your shorts to dry out naturally efficiently, so you never let anything get in the way of having fun! Our swim shorts are made from the best materials to ensure comfort, durability, and functionality. The fine mesh linen is made from the finest polyester which is ultra-soft and equipped to endure all hurdles of the day. No matter which country you’re from, you can never go wrong, you can never go wrong with our comfortable men’s designer swim shorts. Thus, we ship our shorts around the world, FREE of cost. It doesn’t matter what the time, location or county is! Because our shorts are NEVER not stylish. In accordance with our values, we allow our customers to return their products if needed. 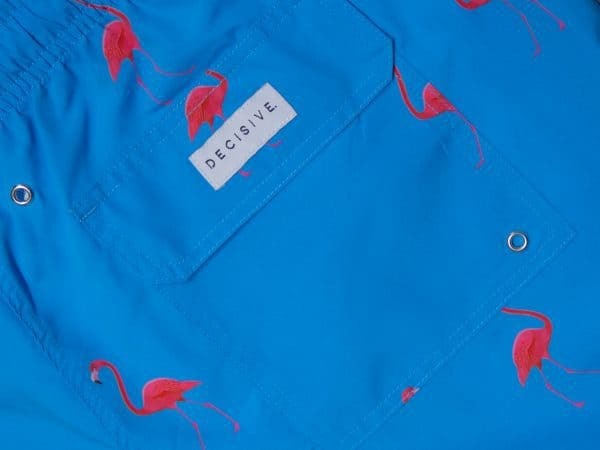 To place a request for return, one simply has to send an email to hello@decisive-beachwear.comalong with your ID. Any product can be returned within 60 days of purchase, no question asked. But for a successful return, the item in question (along with the box, tags, etc.) must be in original condition and unused. The item can be returned for a full refund, but this will not include the cost of shipping and handling. What to look for when shopping for men’s designer swim shorts? A stylish short can undoubtedly go a long way in helping you make the right impression, but it is all worthless if you find yourself uncomfortable. Discomfort will not only prevent you from enjoying your time to the max but also could lead to rashes if the material isn’t compatible with your skin. So, make sure that you try on the shorts before buying them and never compromise comfort for fashion. A mere label should not be enough to convince you of a short’s merits, especially in today’s world where knockoffs are so common. When buying, make sure you buy from the original outlet so as to avoid getting scammed. The design should be up to date, pleasing to the eyes and most importantly look flattering on you. Make sure to feel the insides to get a good idea of the quality of material and observe the sewing work well to establish its quality. There’s no use in spending on a designer short if they’re going to end up torn within a week. Swim shorts have to face several environmental factors such as the sun, water, and friction so it is necessary to invest in shorts that can endure. It is recommended that you scrutinize the material well before purchase, additionally ask the seller if the shorts come with a warranty and any other associated conditions. This will ensure that you don’t end up facing a loss. While most companies will try to convince you that their high pricing is justified, know that it is not worth it to break the bank over some swim shorts! Considering the variety of choices available nowadays, opt for one that is not only within your price range but also has a justified price. So, if you’re ready to get the summers started on a stylish note, then place your order on our site so our comfortable and affordable swim shorts will be right on their way to you! Posted in swimwear and tagged designer swimwear, men's designer swim shorts, swim shorts, swimwear. Great guide! Really love the flamingo design! Nice blog post! Really like the swim shorts. ?